Monitoring the briny depths, the aptly named Millennium Falcon robot serves as the eyes and ears for scientists studying the effects of tidal- and wave-energy projects on marine life. With the ability to gather unprecedented data on the impact of underwater equipment used to harvest wave and tidal energy, the Millennium Falcon robot will help researchers explore the ocean’s future as a renewable energy source. 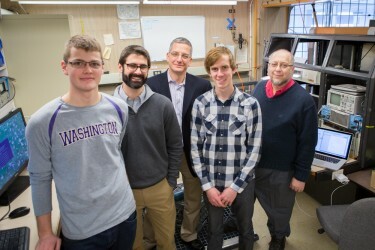 “We’ve really become leaders in this space, leveraging UW expertise with cabled instrumentation packages like those developed for the Ocean Observatories Initiative. What’s novel here is the serviceability of the system and our ability to rapidly deploy and recover the instruments at low cost,” said Andrew Stewart, an ocean engineer at the UW Applied Physics Laboratory. The instrument package can track and measure a number of sights and sounds underwater. It has a stereo camera to collect photos and video, a sonar system, hydrophones to hear marine mammal activity, sensors to gauge water quality and speed, a click detector to listen for whales, dolphins and porpoises, and even a device to detect fish tags. A fiber optic cable connection back to shore allows for real-time monitoring and control, and the device will be powered by a copper wire. The breadth of sensors and various conditions this instrument can measure is unprecedented, researchers say. The tool also is unique for its ability to attach to most types of underwater infrastructure, ranging from tidal turbines to offshore oil and gas rigs. This allows researchers to easily deploy the instrument far offshore and recover it quickly at a relatively low cost compared with other approaches. “It could be a first step toward a standardized ‘science port’ for marine energy projects,” Polagye said. Members of the BluHaptics team. The startup’s algorithms and software provide haptic — or force — feedback on the joystick-like controller. Operators are guided into the perfect grasp and manipulation of an object, and can rotate the image to view the arm’s position in relation to other objects. The technology also creates a 3-D representation of the ROV’s target objects and their environments, which the operator can view on a monitor or through a virtual reality headset. BluHaptics’ technology is largely based on the recent Ph.D. dissertation of Dr. Fredrik Rydén, a research associate in the UW’s electrical engineering department.